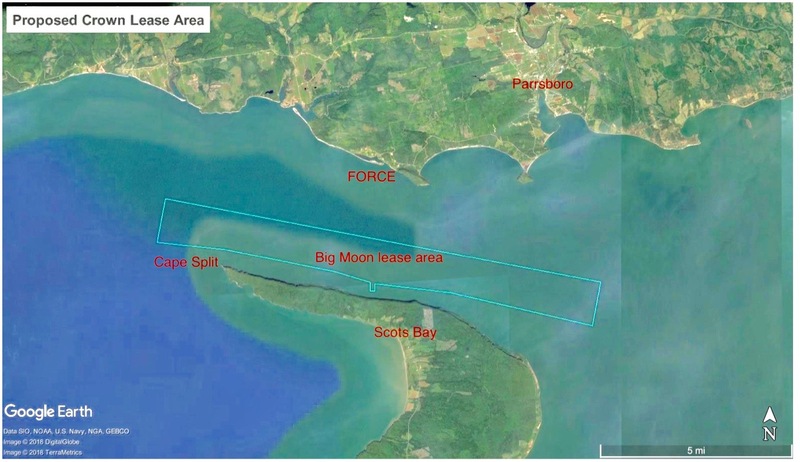 The country manager for Big Moon Canada is praising the Nova Scotia government after the province granted his company two permits to generate tidal electricity on the north side of the Blomidon Peninsula near Cape Split. “Nova Scotia will be seen in the not-too-distant future, like Denmark was with wind, as the leader and the industry head of tidal power in the world,” Jamie MacNeil predicted today during a telephone interview. “The government of Nova Scotia has taken a first step with FORCE and now through this process has taken the next step to bring in the next generation of tidal developers,” he added. The provincial minister of energy announced yesterday that Big Moon has been granted a five year, renewable permit to install up to 5MW of generating capacity and to sell its electricity to Nova Scotia Power (NSP) for 35 cents a kilowatt hour. MacNeil says it will not be as difficult as first thought for Big Moon to connect to the power grid. He explained that the company is leasing property from a farm that is already connected. MacNeil says Big Moon has been listening to fishermen in the Bay of Fundy and has already commissioned a comprehensive study that gathered baseline data on fish in the Minas Passage. “And, we’re now in the midst of a lobster study, once again being done with participation from the fishers and others,” he adds. According to MacNeil, Big Moon is using a combination of older, but proven technologies. A 150-foot-long barge fitted with a steel keel is attached to super-strength polyethylene rope wound around a big drum at the land-based generating station. As the keel absorbs energy from the tides, the barge moves with the current and the rope made of lightweight Dyneema fibre turns the drum to produce electricity using a wind generator and its gears. “We’ve incorporated old and proven technology like work barges and high modulus ropes and drums, gears and generators and we’ve put them together in a new system,” MacNeil says. He adds that Big Moon is hoping its system will harness the power of the tides effectively over long periods of time. MacNeil says Big Moon’s immediate goal is to get its devices into the water to demonstrate the success of its technology. “Obviously, there’s a great resource here for the people of the province of Nova Scotia and quite frankly all of Atlantic Canada,” he says adding that the company wants to produce electricity at a price that can compete with other renewable sources. “We’re very anxious to reward the faith that the government has placed in us and hopefully help to develop this tidal industry here in Nova Scotia,” he says. This entry was posted in Tidal Power and tagged Big Moon Canada, Jamie MacNeil. Bookmark the permalink. This disruptive technology removes fish kill by capturing kinetic energy from the tidal current without using rotating turbines. This technology deserves serious consideration. 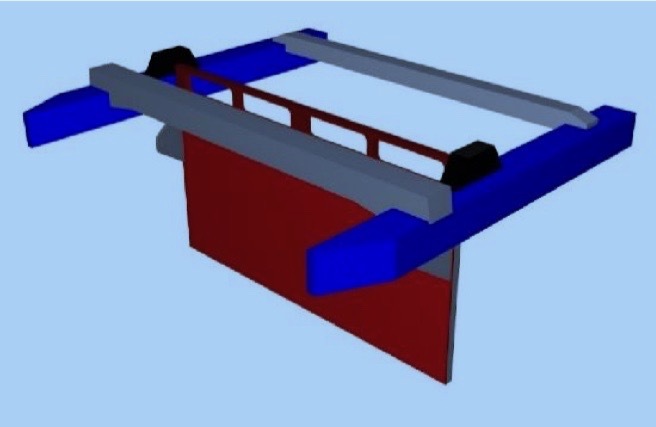 The kinetic keel allows for the coexistence of energy extraction within the marine ecosystem with what appears to be very minimal impact on marine life. As you test your concept please keep environmental concerns front and centre at all phases of development. The Bay of Fundy is a delicate and precious system and demands utmost respect and protection. I remain somewhat skeptical until I see the results of the test (which is only 100 kW). There is also the issue of multiple lines to shore causing navigation issues, catching nets and debris and impacts to marine life. Storms are also a big issue, especially if you plan bigger units and multiple units. You won’t know until you try though, so best of luck. There will need to be two barges otherwise only one cycle will generate or two beach crossings and two fixed points in the water and a ” loop” of dynema with one bight slack. The keel on the return trip will need to be lifted or at least allowed to ” feather” or the barge or barges will mix it up. Nothing that cannot be fixed with a lot of ocean and a lot of money. The real thing will grow in complexity and scope. Could make it a floating salmon farm and then the fish can get exercise on each trip , might make farm raised fish taste better.